Earlier this week, New York City Mayor and billionaire Michael Bloomberg ordered the eviction of occupation activists at Zuccotti Park. The eviction at Zuccotti Park comes after similar evictions in Oakland and Portland. While the eviction of Zuccotti Park was underway, the Occupy Wall Street media team issued a statement declaring, "You can't evict an idea whose time has come." "Our aspirations overlap; our struggles converge. Our oppressors, whethergreedy corporations or military occupations, are united in profiting fromwars, pillage, environmental destruction, repression and impoverishment. Wemust unite in our common quest for freedoms, equal rights, social andeconomic justice, environmental sanity, and world peace." The US Campaign is working hard to raise public awareness of the counterproductive and unjust use of our tax dollars to fund Israel's brutal occupation. National Organizer Anna Baltzer has participated in occupations in Oakland, Wall Street, Chicago, San Francisco, Atlanta, and beyond, where she has marched, spoken, sung freedom songs, danced in a flash mob to “I Will Survive,” and more. Be a part of the movement to reprioritize government spending and help us bring the cost of the Israeli occupation to the Occupy movement! 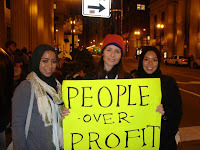 And be sure to check out Anna's pictures from various Occupy locations around the US!